How many children do you have? We have 5, his and mine, 3 daughters and 2 sons. How many grandchildren? What are their ages? There are 9 grand kids, and 4 surrogate grand kids. The oldest girl just turned 6 this last weekend. After her there is a 5 yr old, 4yr old, 4 that are 3 yr olds, 2 yr old, 18 month, twins that are 16 months old, 14 month, and Itty Bitty is 11 months. Any great grandchildren? Ha! Won’t that be something when they start coming! After the initial elation, what was your first concern upon hearing you would soon be a grandmother? I wanted to help decorate the nursery in the worse way I was afraid I wouldn’t be asked to help! After my daughter in law decided on a design I painted the walls and added a painted border that matched the toile she picked out for the bedding. I have painted several of the kids’ rooms with murals. How often do you get to see your grandchildren? Some of them several times a week, most at least once a week. They all live here in the valley. What is the best thing about being a grandma? Mostly that I can be involved in my grandkids lives as much as I want and can manage to be. I have more wisdom and patience this time around, and I hope to be an influence and soft place to land should they need me. What is the most challenging part of being a grandma? Energy! And time, and sleep! Sometimes it take a moment to remember what their name is when I want to call them! And remembering that I want each moment to count in the middle of all the diaper changes and cleaning up messes. I have so much I want to give them if I can. I spend about 30 hrs a week with them, not counting weekend nights or family gatherings. I have had to make a lot of personal sacrifices like my social life, (which is non-existent at this point, who has the energy?) 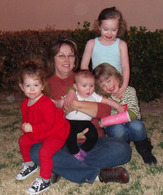 and my hobbies (which are now making gifts for the kids) to spend this time my grand kids. They grow up so fast; I know I won’t be sorry down the road. What is your favorite thing to do with grandchildren who visit your house? There are many things, mostly crafting I guess would be my answer. When I have the energy to do the cleaning up, we bake bread. I’m also teaching them to sew. Sometimes we sit in a circle and do what I call what’s your story? I will start off with a sentence like, A little frog hopped on a Lilly pad for a look around the pond; then I look to the kid on my right and it’s their job to add to that, and around the circle we go. We have some pretty silly times doing that! What is your favorite thing to do when visiting grandchildren at their house? I love to see them interacting with each other and playing with their toys. I always go into their rooms and sit on the bed and ask them questions about their things. How do you maintain the bond between yourself and your grandchildren between visits? Well since I see them so often that’s not really an issue! Just between us, I have declared Fridays as a no grandkids day unless it’s an emergency! I have to have a break once in a while and get my housework done. What do you most want to pass along to your grandchildren? We have a family heritage and history of loving God and His ways in our family. I hope that our tradition will be carried on to future generations. What is one word you hope your grandkids think of when they think of you? Love and fun. 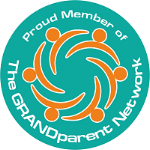 What is one thing you wish you had learned earlier as a grandparent? Wow I’ve been so busy being one I’m not sure what that would be! What one bit of advice would you give a new grandma? I have worked hard at establishing a good relationship with my daughter and son in laws. This has laid the foundation for the wonderful freedom I now enjoy to encourage, instruct, and discipline my grand kids without having to tip toe around and wonder if I’m going to hear about something I did or said. Establish rules for your home when the kids are visiting, but make sure you are not crossing parental boundaries ever! Rules are simple at my house: food and drink stay in the kitchen. Babies on bottles are held while drinking their bottles so I don’t have drips on floor and furniture. Can you imagine what my house would look like if they all ran around snacking everywhere?! My craft room is off limits and kids enter only when invited and with grandma. (This is for safety reasons mostly.) My bedroom and bathroom are not for playing in. We are nice and loving to each other ALL the time! Nothing will get you in time out faster than being mean to someone. Do you have a website or blog? What is it about? I do have a blog thank you very much! It is http://www.familyhomeandlife.com. It is pretty much about my time with the grand kids, crafts with the grandkids, and things I make for the grandkids. But I throw other things on there too.